In a recent project I developed a bridge component to connect a backend web service with a credit-card terminal. The terminal can only speak a binary protocol. The bridge needs to map the binary messages to the corresponding backend calls. If you are interested in details about the protocol, see this (German) Wikipedia entry for the GICC protocol. To minimize delays at the terminal end, the customer demanded a certain level of performance. Transactions are required to complete in under one second end-to-end, i. e. including the time for the backend service to go through. An important part of the development and testing process therefore had to be performance testing and profiling to make sure that even under peak loads transactions are going to finish within the allowed time frame. I wanted to use JMeter, but at first glance it seemed to only support “more usual” protocols without requiring me to write a custom extension. Being under a rather tight schedule, I tended towards writing a very specific measurement tool instead of learning how to extend JMeter, because I was unsure about how much effort that would be. Before doing so, however, I decided to do a little more digging into JMeter’s documentation, and indeed I did come across a section that had eluded me before. As a colleague had not easily found this feature of JMeter either, we thought a little spreading the word could not hurt – go on reading to find out more. opens a TCP/IP connection to the specified server. It then sends the text, and waits for a response. Obviously this cannot be put into the text field verbatim and be expected to work. There are three implementations provided for the aforementioned TCP Client class. The default one is TCPClientImpl which does what is described above: Send text and wait for an answer. More interesting for our use case however are BinaryTCPClientImpl and its sibling LengthPrefixedBinaryTCPClientImpl. This implementation converts the GUI input, which must be a hex-encoded string, into binary, and performs the reverse when reading the response. When reading the response, it reads until the end of message byte, if this is defined by setting the property tcp.BinaryTCPClient.eomByte , otherwise until the end of the input stream. This implementation extends BinaryTCPClientImpl by prefixing the binary message data with a binary length byte. The length prefix defaults to 2 bytes. This can be changed by setting the property tcp.binarylength.prefix.length . This is already quite usable, however for more than a very few requests copying the TCP Sampler entry and filling in different hex strings would not scale well. 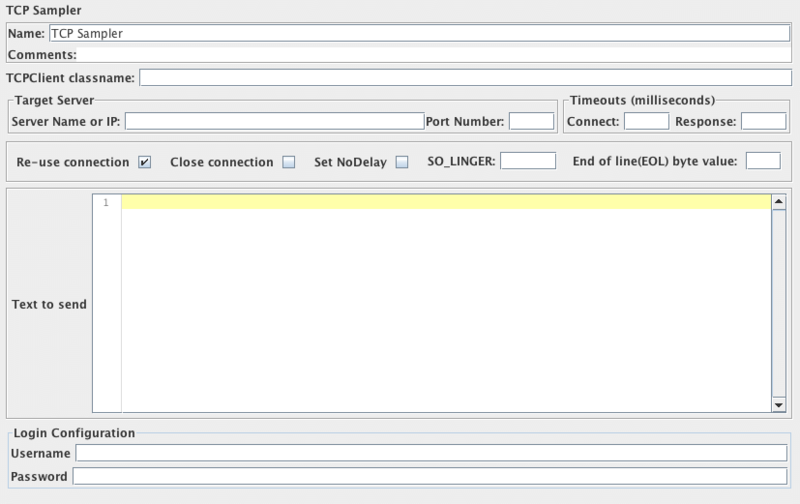 Fortunately the other JMeter features can be easily combined with the TCP Sampler as well. In my case there were several types of business transactions, each having a specific form of request, but inside the individual requests some values need to be filled in with barcodes and amounts. JMeter offers a variable replacement mechanism that can be driven by external data sources, for example CSV files. and saved it as a_transactions.csv in the same directory as the JMeter test plan. Notice that I set up the variable names to correspond to the columns in the file and also selected the appropriate options to limit this file’s data to the current thread group (more on that later) and also to “recylce” the file, i. e. start over with the first data row again when the last one has been read. This allows for continuous test runs. Of course these settings are very much specific for the test case at hand. As you can see in the screen shot I defined some more global variables that are used to configure some settings in a single place. They are used to set up the several thread groups and their sub-elements. In my case, each thread group is configured to test a specific type of transaction. By tuning these global variables or by enabling/disabling single thread groups a great deal of flexibility is achieved. One interesting detail to know about using external files as data sources for test input is that they are not automatically sent to remote nodes, so if you need JMeter’s remote control functionality you have to make sure the CSV files are present on each node. They need not be identical in content, of course, but the file names configured in the test plan must be present on each node. Even though at first it might not seem possible or easy to do, JMeter is very much suitable for binary protocol measurements, even without writing a custom plugin for the protocol at hand. This holds true, if all you need is simple roundtrip timing and if the protocol lends itself to the template based approach described above. Of course, more complex protocols might require a more elaborate preparation and setup of the external data sources, but in many situations the out-of-the-box functionality will be sufficient. We have an UDP sampler, lot of charts to analyze results, etc.